As one of the most popular retirement activities, birdwatching can combine a nature hike, a social event, a picnic and other fun activities all in one. It's important to try new things as you age, and birdwatching will provide you with a hobby that stimulates your mind, body and spirit, making it a perfect activity for keeping you young both in body and in spirit. What's the difference? Dedication. A birdwatcher is considered a casual hobbyist by a birder, who delves into the science on many levels. Birders take long trips specifically designed to catalog birds or help with conservation efforts. Birdwatchers often enjoy scouting for birds while hiking, or setting up desired habitats in their gardens or backyards. You don't have to become a dedicated birder during your retirement years; start taking walks in the right areas and see how far your hobby develops. Don't worry about the labels and do what comes naturally. Unlike many other hobbies, you can pick up birdwatching right away. It's a skill that you develop as you go, becoming more adept at spotting creatures in their environment, deciphering body structure, wing cuts, songs, the difference in beaks, molting, migration patterns and other key elements. Developing these skills will keep your eyesight challenged and keep you paying attention at a high level, which many retirees automatically start to let slide. The following items will help you get started in this fun hobby. Pick a pair with a magnification to enhance, not strain, your eyesight, and with comfortable lenses that rest easily against the eyes or glasses. Also note that most birdwatchers want a focus option of 10 feet or less. It might be helpful to stop by a local camera shop or sporting goods store first to examine a few pairs. Then, if you like, you can shop websites like Binoculars.com or buy your set in-store. An average pair costs $100, but price will vary depending on features. Aficionados also use telescopes and digital cameras to capture their sightings. There are state- or region-specific guides, country-based, good portable field books and bird-specific varieties. If you're exploring fields and trails near home, contact your state's department of natural resources to request birding materials and find out when they host free lectures on indigenous wildlife. Many beginners also rely on the Golden Field Guides' Birds of North America, which has helpful maps, song recognition phonetics, gender and generational plumage guides, and, best of all, fits into a coat pocket. As your intention grows, you might want to spend a few winter nights curled up with National Geographic Field Guide to the Birds of North America. At nearly 500 pages, it's not the best book to tuck into a backpack, but you can do research to take into the field later. Your personal preference will dictate the type of notebook you need for recording birdwatching information. Every time you go birdwatching, make detailed notes about what you saw; you can also store pictures, plant samples, and other tidbits in your notebook. Don't go wandering without a good sunscreen, hat, and environmentally-friendly bug spray. It's better to wear light khaki pants rather than shorts to traipse over the fields and through the woods, but let personal comfort direct you on this. Pick a walking shoe that fits and breathes well. If you're planning a longer hike, make sure you have water, light snacks, any medications you may need and a cell phone. It also can't hurt to carry medical alert information if you have diabetes or other chronic ailments. Chances are you'll never need to use your medical alert information, but it's better to be safe than sorry. Many of the large birdwatching organizations organize great travel trips all over the United States and the world. Field Guides specializes in exotic tours to locales such as Thailand, Trinidad, and Brazil. There are a few prime locations in America as well. Wings is another birding-specific travel guide service. Their tour operations span the globe; check out their website for information as well as inspiration on watching beautiful birds. If you're looking for birding tours offered specifically to seniors, the Road Scholar organization, formerly known as Elderhostel, offers a number of tours each year across the United States and the world. These tours give you the perfect opportunity to see the birds of the world while interacting with your peers in a fun and educational environment. Whether hiking in the local woods or canvassing Argentina, birding is best done by following migration patterns and observing species in their natural habitats, so your options for birding travel are extensive. Many consider Phoebe Snetsinger the world's premier birder, and she carried the activity on into her retirement years. She classified more than 8,000 species and possibly thousands more subspecies. Researchers still use her notes and photographs to gain a better understanding of wildlife. The book Birding on Borrowed Time tells of her desire to continue birding while battling melanoma in the early 1980s. She died on a birdwatching expedition in Madagascar in 1999 at the age of 68 and remains an inspiration to all senior adults who want to spend their golden years continuing to learn and grow. Check out the American Birding Association, Bird Life International, Surfbirds, and The Nature Conservancy to understand the passion of birding. If you love birds but don't always have the energy to get outside for a hike, you can learn to identify birds by listening to their songs and calls with help from Naturesongs.com. 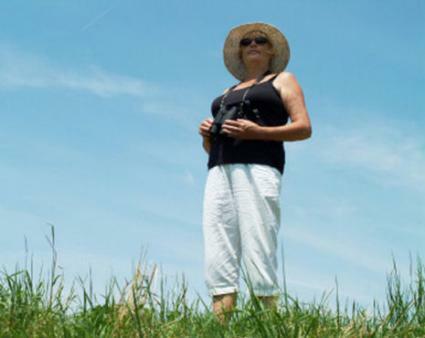 Whether birding is a new activity now that you've retired, or you have even more time to do it since reaching a certain age, there's no doubt that it's an entertaining and educational activity for seniors.